Animals are seldom taken into consideration as a main research focus within the studies related to the relationships that societies maintain with nature and their environment. Animals are indeed generally conceived either as additional features of local symbolic landscapes, or as economic resources (food, raw materials, strength). It is pregnant if one consider for example Thai studies in which animals appear more or less implicitly in researches focusing on topics related to ritual practices (sacrifice), land exploitation (agriculture, livestock farming) or environmental risks (natural disasters, pollution, epidemics, traffic). On our part, we advocate that Thailand invites us particularly to develop a methodological approach that regards animals as “agents” whose interactional status has to be discussed, not as mere symbols, resources or danger. 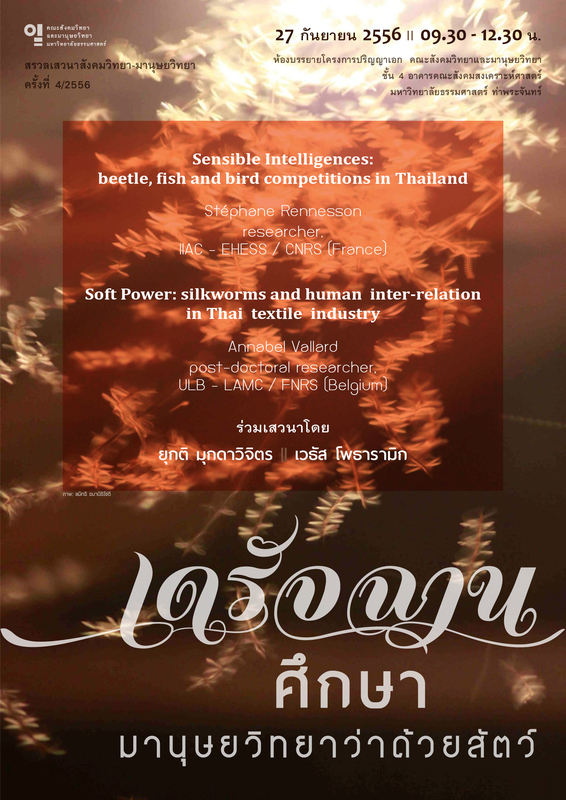 Aiming to pay tribute to Thai creativity in instituting uncanny interspecies communities of interests, we shall provide insights into the way we are trying to open the door of anthropology to animals such as Silkworms, Rhinoceros Beetles, Fighting Fish and Red-whiskered Bulbuls.